The EU Foreign Policy in the 21st Century: Visions, Ambitions, Realities - Atlantik-Brücke e.V. Martin Schulz, President of the European Parliament, was not afraid to speak his mind regarding the European Union’s foreign policy during his talk on February 25 in Berlin. 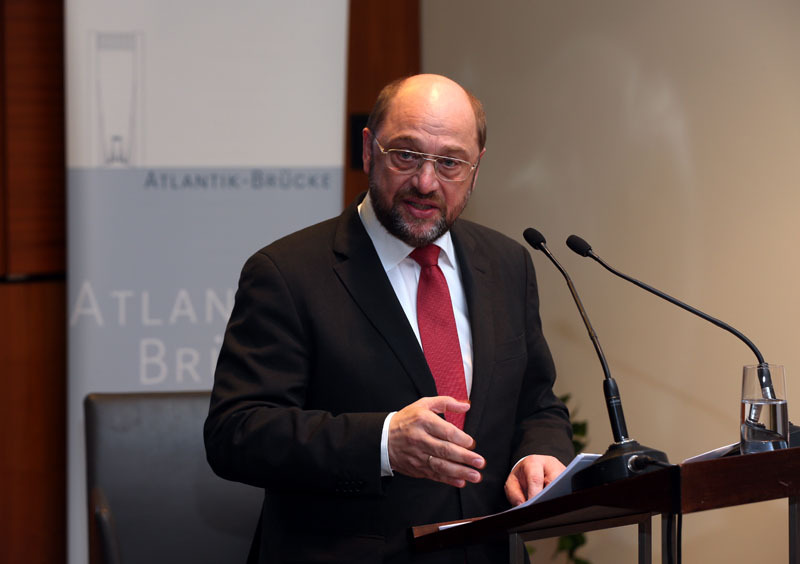 During his speech in front of over 100 guests at a joint event hosted by Atlantik-Bruecke, the Daimler Corporation and the German Council on Foreign Relations, the Social Democrat drew an honest and sobering picture of the EU and its role as a global actor. According to Schulz, there is no other political area where claims are further from the true reality than in the European foreign policy. The Arab Spring, the crises in Lybia and Syria, and even dealings with China and other regions of growth show that the European states are often simply overwhelmed by the strategic challenges they have to face. Schulz went on to state that in the reality of the 21st Century, the interests of the European states are better secured by the transfer of sovereignity to the European level. This “abdication of power”, as the convinced European would say, “will be returned to us as a gain in strength in the globalised world.” The loss of governing ability of the nationstate has already become obvious in many areas; by 2050, Germany will not qualify as a G8-state according to today’s standards. “Germany is too small for a world without Europe,” Schulz says. “We could be so strong, but we are so weak”, stated the President of the EU Parliament. However, Schulz believes that the European project still has enormous appeal and great potential to serve as an example for other regions in the world. If Europe wants to have global impact and influence, it will have to create a real European government with a strong European parliament.